"Fab Tec Screens are known for simplicity in design and strength in construction. We combine the best features to give you a machine you can use, depend on, and appreciate the returns." Our feed box and discharge lips are lined with abrasion resisting plate. The Incline's screen box is held together by huck-bolts. Huck-bolts are the strongest mechanical fasteners known, eliminating threads that strip and welds that might crack. All our screens come complete with rubber screen cloth protector and clamp bars. TEFC electric motor with pivot motor base and 3 RB power band belt. Safety guards provided. 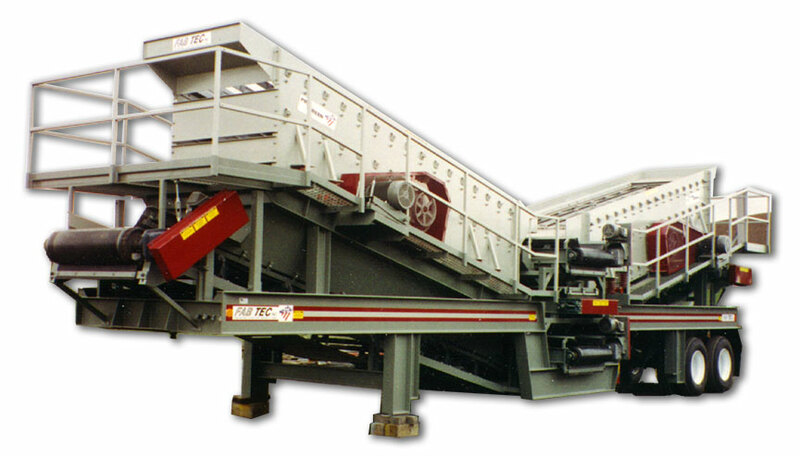 The PRO INCLINE SCREEN also offers the end tension wire deck for high performance of fine screening. Cartridge-style machined steel bearing housing 1 1/4" wall thickness. 3/4" grade 8# bolts with L9 washers and self locking nuts. Clamp bearing housing to screen sides. A slip fit on shaft and press fit in cartridge type housings makes removal easy and also gives the best bearing performance. Lubrication goes right to the center of the bearing through alemite grease fittings in the bearing housing. The groove and holes in the inner bearing allow even distribution of new grease to the bearing. Eccentric shaft is 4150 stress proof shafting. Eccentric weights are clamped to the eccentric shaft, add-on weight are supplied to adjust the amplitude of the screen action. Eccentric shaft housing is a heavy duty 8" mechanical tube with 1/2" wall thickness. 5160-H Alco steel springs to isolate screen vibration. All replacement parts are off-the-shelf, made in the USA, high quality components. This screen has been well proven for reliability and performance. TEFC electric motor included with pivot motor base and 3 RB 120 drive belt. 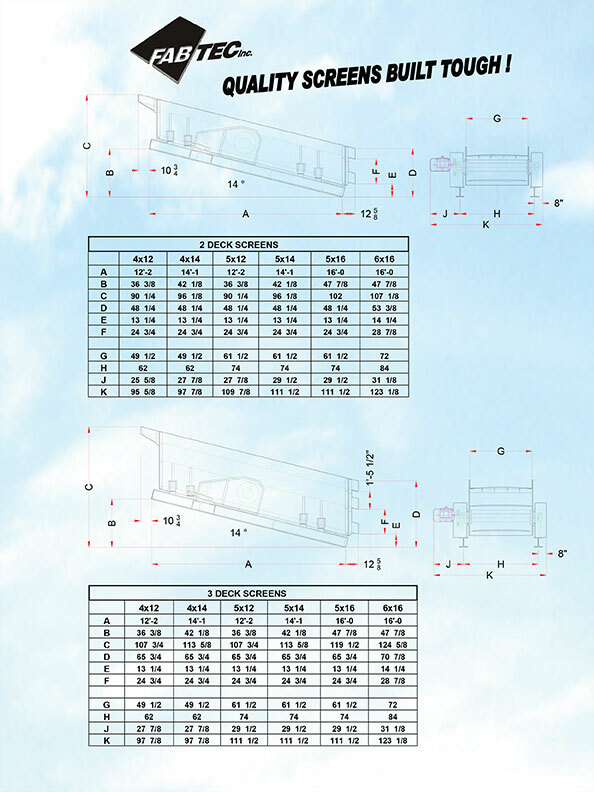 Base frame is constructed of 10 WF beams 33# per ft. with 8" channel 13.75# cross supports. Screen decks are constructed of 3" x 2" rectangular tubing and 1/2" x 3" FB steel to form a very strong screen deck. 130 MM F.A.G. Spherical bearings specially designed for shaker screens. Center support tube 9" with 1/2" wall and 2" thick flanges. >Fab Tec designed cartilage-style bearing housings, very heavy-duty with 1 1/4" wall thickness. We also offer end tension decks for fine screening. The same screen used on the Fab Tec Pro Mighty Mite screen is useful as a stationary screen when mounted on a sub frame structure. 6x6 x 1/2” angle iron subframe. The same screen used on the Fab Tec Proscreen is very versatile and easy to mount and is available with either a hydraulic or electric motor mounted on the screen including a complete sub frame structure. Solid steel machined bearing housing with 80mm spherical bearings. Firestone air mounts to isolate screen vibration. 4150 alloy shaft with outside eccentric weights with provision for add-on weights, 1/4" plate side walls and 3/8" plate bearing mount plates, screen fasteners are huck bolts and grade 8 locking nuts. Sheave, bushings and belt provided. Optional Teco 71/2hp 1800rpm TEFC motor. - with features and options that get the job done right. Fab Tec screen plants are individually engineered to meet your specific screening needs, with many option available for the most efficient fit into your operation. Fab Tec craftsmanship gives you reliability with less maintenance, better operator safety, and the confidence of owning the best. All Fab Tec plants include sandblasted chassis, rust inhibitor primer and two finish coats of acrylic-alkyd enamel for superior weather resistance. Fab Tec protects your workers with guards and enclosures throughout. Fab Tec walkways and platforms provide safety and convenience with 3" toe boards, 42" handrails, and moveable access ladders. Fab Tec plants have AR plate lining at all material contact points, such as discharge chutes that protect your investment from wear and tear. CALL 208-883-8433 for the Fab Tec dealer nearest you.